This post is a piggy-back from Christine Perkett’s (@missusP) written thoughts after her discussion panel at the Social Media and Communities 2.0 Strategies conference, go to PerkettPRsuasion.com for more of the original conversation. The topic of TRUST has been a personal soapbox item recently. I read 30-40 blog posts daily and attend a number of social business/media events each year, and just about every day I hear how important trust/building trust/earning trust/maintaining trust is to relationships with our customers and communities. 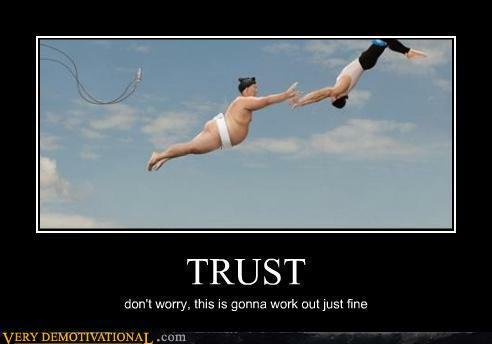 However, nobody ever defines trust; it’s a subjective term like love or truth. If you don’t have a firm grasp of what it is, how are you ever going to be able to measure it? And everyone knows, if you are not measuring it, you are not actively managing it. Finally, I come full circle; if you are not managing it, it’s either not important or you are missing something BIG. I am assuming it’s the latter. My Definition: Trust is the confidence that a party/company/person/group is sincere, competent and reliable to meet the customer/person or affected group’s expectations. How can you measure trust? The simplest answer is probably to just survey and ask your customers directly. This sounds a bit uncomfortable (for both surveyor and recipient), and may lead to biased results. Net Promoter Score (NPS) is also a viable option. Asking the question “How likely are you to refer Company X to your friends, family and colleagues?” implicitly asks for the level of trust in a party. However, the core NPS question can be interpreted to mean your product, your service, your price, or your value, and still will not let you know if you are a trusted partner. Another way to measure trust (and possibly moved the needle) might be through the measurement of its core drivers, as I defined earlier – sincerity, competency and reliability. I like to think this methodology is analogous to a 3 legged stool. If one of the “legs” is broken, the stool is going to rock or come crashing down (just like your trust). Sincerity: Asking your customers if they believe you care about them, are not deceitful, honest or have their interest at heart. You may ask them to review your site, materials, products, etc.. to learn if they believe you have their interests top of mind or even if you understand them. Audit yourself as well. Drug and Oil companies seem to consistently fall short on this driver. Competency: Do you or your company have the ability (or competency) to deliver as expected? I am sure we all run across someone or a company that has the best intentions and is always available but their end product or service is just lacking. Sometimes lacking in this driver is due to poor operational processes, training, general knowledge or expertise. I see consultants and inexperienced people/companies falling down on this attribute most often. Reliability: Do you deliver on time, per spec, within budget of your customer’s expectations consistently? This key driver is probably the easiest for you or your customer to measure, because it is very tangible. Did the delivery company show up on time? Has a company given you the right product? Did it cost more than the sticker on the box? Internally, companies can ask if they met their SLA’s (service level agreements) and how often. They can look at their uptime/downtime of their website. They can monitor and track billing issues. We trust FedEx here; rarely do we trust the USPS. This is clearly only my perspective. I would love to understand if anyone else is questioning the TRUST verbiage, how do they define trust, how are they measuring or planning on measuring? Maybe this is just a personal rabbit hole that does not have an answer, but I like the question. Hopefully, as more posts are provided, you will begin to trust me in my sincerity, competency and reliability to deliver insightful and thoughtful information to your inbox.